MCA's certification programs are designed by the industry's leading experts—to make YOU a leading expert. Are you serious about building your knowledge, confidence, and reputation? Certification is the way to go! With the knowledge that comes with certification, you'll be able to guide contractors and consumers alike in choosing the right metal roof for their needs. This program is open to paint & coatings companies, roofing product manufacturers, coil processors, and roll formers. ROOF INSTALLATION MANUAL - FREE! Get your FREE copy of the Metal Roof Installation Manual from MCA. The manual includes 20 chapters and hundreds of pages and illustrations to make sure industry best practices are used when installing metal roofs. It's a great way to educate both new and experienced metal roof installers. Then, test your knowledge with the exam available. Interested in metal composite materials (MCMs) for high-end, monumental building projects? With this certification program, you'll be joining a powerful group that includes CEI Materials, LLC, Custom Metal Contracting, East Coast Metal Systems, Miller-Clapperton Partnership, NOW Specialties, Quality Metalcrafts, LLC/Americlad, Shaffner Heaney Associates, and Sobotec. 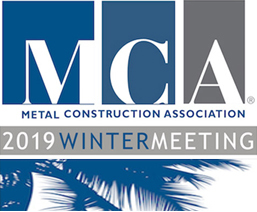 MCA is continuously updating technical resources to give you the most current, comprehensive coverage of the most important issues affecting our industry today. Below are two recently updated/developed white papers, free to download. MCM manufacturers typically provide two types of core products: standard and fire retardant. MCA's MCM Fabricator Council has updated this paper to clarify the allowable uses for standard and fire retardant MCM in accordance with the 2006-2018 editions of the International Building Code. Chock-full of photographs and data, this extensive report documents and summarizes the work conducted to determine the roof service life of a low-slope 55% Al-Zn alloy-coated steel Standing Seam Roof (SSR) system when installed using best practices. Download the summary or full report.